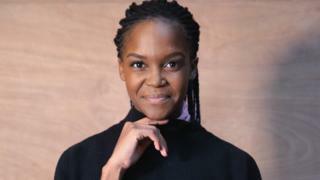 Oti Mabuse has two things on her mind: the opening night of the musical she's choreographed - and having her first cup of tea of the day. "I really love choreographing, I love to be on the creative side of any production, and so... actually, sorry, can you hear me? This kettle is really loud." The Strictly star is speaking to BBC News on the phone from a hotel room in Colchester, ahead of the launch of a new production of Ain't Misbehavin'. "In the beginning, I didn't even know it was a musical," she explains, having been assured we can hear her over sounds of tea making. "In my head it was like one night in London and one night in Colchester. "And then my agent called me and said, 'No babe, this is the real thing, it's a big musical that's going to be running for weeks'. "So I was like, 'Why not?' I love learning new stuff and being in this world. It's been a great learning curve for me." As one of the professional dancers on BBC One's Strictly Come Dancing, Mabuse is used to choreographing treadmill-based routines for celebrity cricketers, but this stage musical has been a different kettle of fish. Named after the Fats Waller single of the same name, Ain't Misbehavin features song from the 1920s and 30s - a period considered to be a golden age for jazz. The songs in the musical date from the era of the Harlem Renaissance - a blossoming of African-American culture that came out of the development of the New York borough, which saw artists, writers and musicians experimenting with new styles. "I was literally working three jobs in January," she points out. "I would choreograph in the morning and then in the evening go off and do a TV show." Mabuse didn't take part in the Strictly tour this year because the first two months of 2019 were taken up with The Greatest Dancer, a new BBC One talent show on which she was a dance captain alongside pop star Cheryl and Glee actor Matthew Morrison. "For me, the whole season was just brilliant," Mabuse says. "To be on the other side of the table was a great learning curve for me. "I got to learn how to speak to people, interact, communicate, I learnt to be a lot more nurturing, considerate and empathetic to people and their feelings, so it brought a lot of experience with it. "I had two acts in the final, who finished in first and second place, and for me that is unbelievable. I'm still working with both of them. And I just want to stay involved in their lives as much as possible." Michael Hogan found a few flaws with the show in his three-star review for The Telegraph, but added: "The Greatest Dancer was still hugely likeable, mainly thanks to the infectious presence of Mabuse and the life-enhancing power of dance." It's true that the 28-year-old seems consistently smiley and energetic, one of the things that has endeared herself to TV audiences. "I wouldn't do anything I don't enjoy," Mabuse says. "I'm smiling every single day because every opportunity I've been given feels like a baby in Disneyland, I'm constantly hoping to move on to the next job." Those other jobs have recently included her TV presenting debut on The One Show last week, which she describes as "nerve-wracking". "With TV presenting, I speak a lot anyway!" she laughs. "If you don't know me you get to realise that. I was really lucky to have Alex [Jones] next to me on that couch because she was so guiding and nurturing." Her path to the UK included a detour via Germany, where a chance encounter with a BBC producer while working on another show, Let's Dance, led to her moving to London and ultimately being cast on Strictly. Her message to those hoping to get into the world of professional dance is simple: "My first passion was to create for young girls the idea that you have to be brave and courageous, it's not easy taking big steps and saying, 'I'm going to be a professional dancer'. "What you have to do is believe in yourself and be different. Try by any means to stand out in a positive way, and always exude positive and kind energy, and that's what I always said to my [Greatest Dancer acts] before they went on." Adding another string to her bow means Mabuse won't be short of career options if and when she retires from Strictly, as fellow professional Pasha Kovalev did last month. "Everything... well, except the engineering!" she laughs. "If the opportunity arises and people think I can hold down the job then I'd love to. All I'm trying to do is put bread on the table." Ain't Misbehavin' runs at the Mercury Theatre in Colchester until 30 March, before transferring to the Southwark Playhouse from 19 April - 1 June.